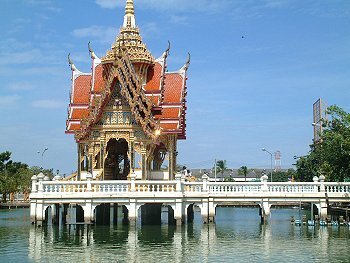 Wat Bang Phli Yai Klang is in Bang Phli district in Samut Prakan. It houses the longest Reclining Buddha in Thailand at 53 m long Phra Buddha Saiyat is a huge reclining Buddha image and the first one. The Ubosot of the temple was just lifted up at the time of our visit, so people can walk through underneath the Buddha image and place gold leaves to the sacred stones.